The Kremlin is refusing to accept proposals by Kiev to restructure $3 billion worth of bonds and demands full payment on the debt. Experts point out that this is an economic as well as a political issue and it could become a bargaining chip in the ongoing negotiations over a bilateral gas deal. A new squabble is brewing between Russia and Ukraine after Moscow announced that it would not accept proposals by Kiev to restructure a $3-billion debt in bonds. “Russia’s position remains the same: Ukraine must make full and timely payment on the bonds acquired in December 2013 with money from the National Wealth Fund,” reads a statement posted on the Russian government website on Sept. 17. 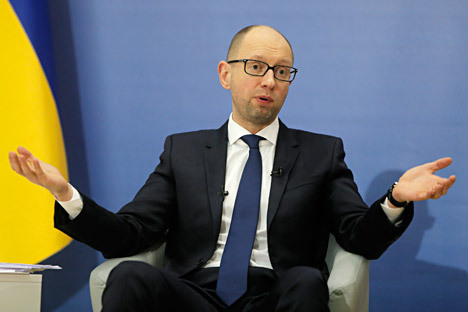 Ukrainian Prime Minister Arseniy Yatsenyuk earlier said that unless Russia accepts the terms of restructuring Ukraine’s debt, it will not get anything. “Russia has refused to take part in the creditors’ committee and has not agreed to the restructuring deal, it wants the debt to be repaid in full. I would like to say once again that there will be no better offer. Either accept these terms or there will be no better terms offered to Russia,” Yatsenyuk said at a session of the Ukrainian parliament, the Verkhovna Rada, on Sept. 17. The issue concerns $3 billion worth of Eurobonds that mature in December 2015. These were issued by Ukraine in December 2013 with a coupon rate of 5 percent per annum, placed on the Irish Stock Exchange and bought by Russia with funds from its National Wealth Fund. So far, Ukraine has been paying on these bonds: In June 2015, it made a timely transfer of a coupon yield of $75 million. Ukraine insists that its debt to Russia should be written off because, among other things, Kiev reached an $18 billion debt restructuring deal with its private creditors in August. They are expected to write off 20 percent of the principal and grant a four-year deferral for repaying the remaining amount. As repeatedly said by Russian Finance Minister Anton Siluanov, Moscow will not be following other creditors’ suit and will not be discussing debt restructuring with Kiev. If Ukraine does not pay up, Russia intends to take the matter to court, in which case Ukraine may be ordered to pay penalties and to cover legal costs. Experts point out that the debt issue is not only an economic but a political matter too. “It is very likely that Kiev will refuse to repay the debt, this is what we hear from Ukrainian politicians daily,” said chief economist with ING Bank for Russia and the CIS Dmitry Polevoi. As regards the financial side, given assistance from the IMF, Ukraine should have the funds to repay the debt. At the same time, the debt issue may affect the gas deal that needs to be signed by the end of September. “Ukraine has already admitted that it does not have money to buy gas, so Kiev’s debt could become a bargaining chip in the gas issue,” said Polevoi. According to him, relations with Ukraine may become even more complicated, all the more so since starting from January 2016, Ukraine intends to start implementing the economic section of its association agreement with the EU. “Ukraine wanted Russia to reach a consolidated position with the other creditors on deferring or partially writing off the debt. Russia, like any other creditor, does not have to be guided by the other creditors, it can have its own independent (in this case tough) position,” said Dmitry Orlov, head of the Political and Economic Communications Agency. “The money came from the National Wealth Fund and it is more valuable than money from traditional sources. This 3 billion is required for infrastructure projects. It is also a matter of principle: Russia did not allow for the possibility of repayment by instalments either during the talks on granting the loan or at any later stage,” he said. According to Orlov, in the 1990s and 2000s, relations between Moscow and Kiev were better and deferrals were agreed, but it would be wrong to extrapolate that situation to the present one.